Rent Hyatt Regency Scottsdale at Gainey Ranch | Corporate Events | Wedding Locations, Event Spaces and Party Venues. Escape to the stunning desert retreat of the Hyatt Regency Scottsdale Resort & Spa at Gainey Ranch. Immerse yourself in our oasis-like hotel for business or pleasure, and experience the luxury services that define our Scottsdale resort and spa. reate the memories of a lifetime in our unrivaled Scottsdale wedding location. 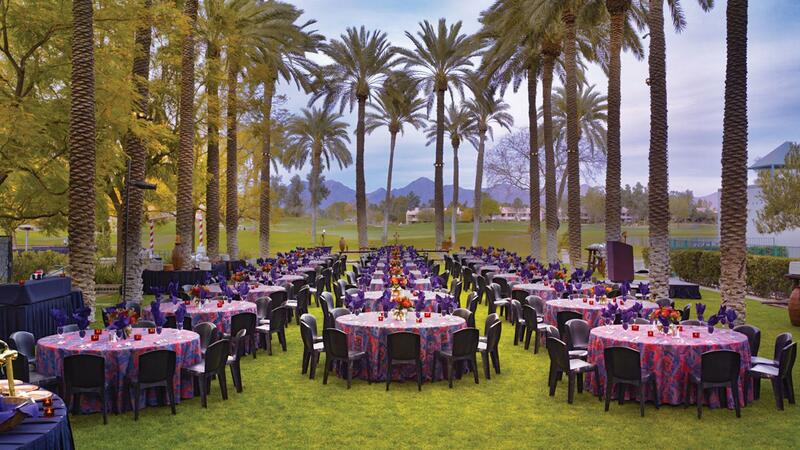 Set amidst flowering cactus, breathtaking sunsets and the majestic McDowell Mountains, our spectacular Scottsdale banquet facilities provide the fine service and culinary excellence you seek. Gather with family and friends in the days before your celebration for soothing spa treatments, championship golf, tennis or simply enjoying time together by the pool. When your special day arrives, relax knowing our team of professionals will oversee every detail to your specifications, so all you have to do is be radiant! Whether you are planning an intimate gathering or a grand celebration with hundreds of guests, our incomparable Scottsdale wedding reception sites present all you need to plan a magnificent party. Corporate gatherings take on an entirely new energy when set amidst flowering cactus and framed against the majestic McDowell Mountains at Hyatt Regency Scottsdale Resort & Spa at Gainey Ranch. Our Scottsdale resort offers state-of-the-art meeting rooms and advanced audio/visual capabilities.